At SNOWatHOME™ we continually strive to bring you the best products for snow making. We know that the strain of continuous use on your tools and equipment can cause inferior products to breakdown. 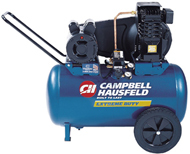 SAH is now a distibutor of Cambell Hausfeld air compressors for snowmaking and auxiluary products. We are now able to offer you a compact, oil-lubricated, belt driven air compressor that is perfect for the demands of home snow making. Making snow is not like running an air gun where the air is needed in short bursts or supply. We run our compressors just like we run our pumps; Long and Hard. We have field tested this compressor and have run it for 3 days, non-stop in freezing conditions, this compressor preformed flawlessly. In addition this compressor is incredibly quiet, when making snow in a noise sensitive area this is key and it always helps with good neighbor relations (as if letting them play in the snow isn't enough). and the SAH Return Policy regarding Freight shipped items.